﻿ h78 at Hulhumale Maldives, Male International Airport (Male City and Airport) | FROM $73 - SAVE ON AGODA! "Excellent location and friendly service." Have a question for h78 at Hulhumale Maldives? "Spacious room and tasty breakfast." "Small room but nice, clean and comfortable." Well-positioned in Male International Airport, h78 at Hulhumale Maldives is the ideal point of departure for your excursions in Male City and Airport. Only 0.1 km from the city center, the hotel's strategic location ensures that guests can quickly and easily reach many local points of interest. With its convenient location, the hotel offers easy access to the city's must-see destinations. At h78 at Hulhumale Maldives, the excellent service and superior facilities make for an unforgettable stay. 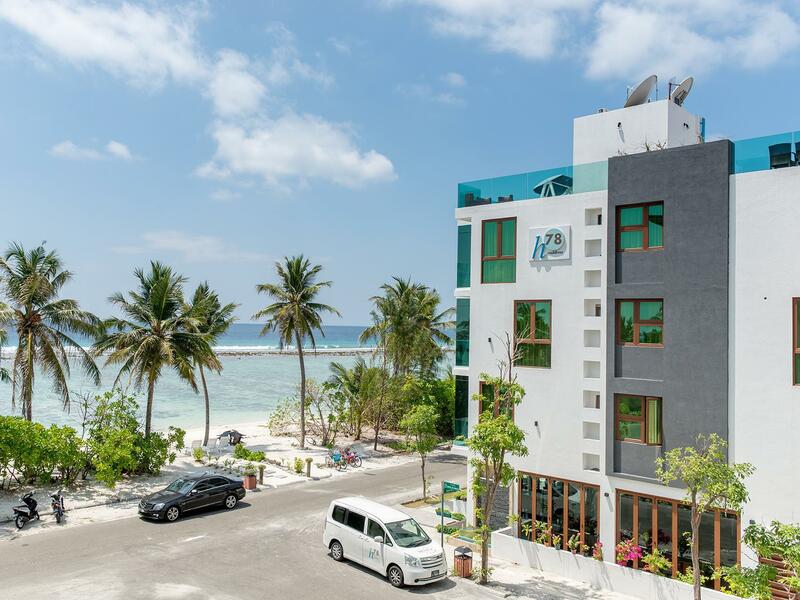 24-hour room service, free Wi-Fi in all rooms, daily housekeeping, 24-hour front desk, express check-in/check-out are just a few of the facilities that set h78 at Hulhumale Maldives apart from other hotels in the city. 15 rooms spread over 3 floors provide a warm and pleasant home away from home. Modern comforts such as television LCD/plasma screen, complimentary tea, free welcome drink, linens, slippers can be found in selected rooms. The hotel's diving, fishing are ideal places to relax and unwind after a busy day. 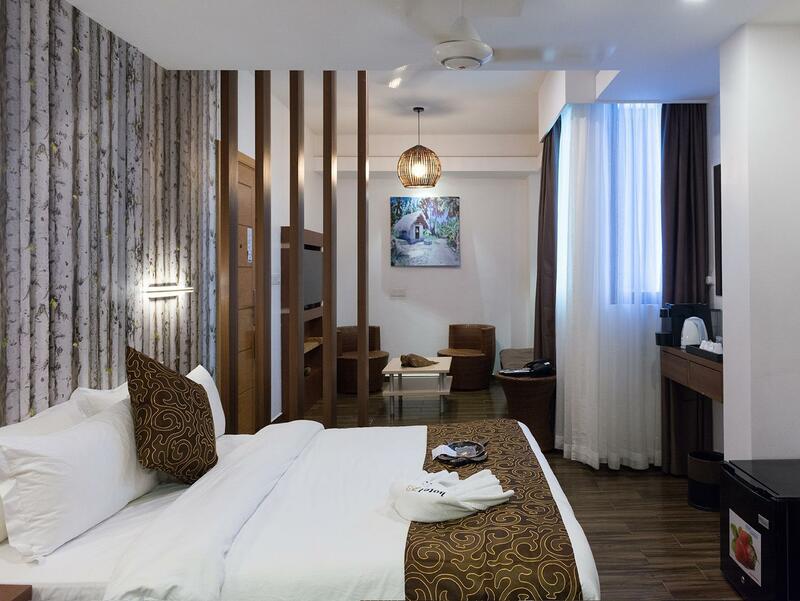 H78 at Hulhumale Maldives is your one-stop destination for quality hotel accommodations in Male City and Airport. "Staff is very good and friendly." Small seaside hotel with 4 floors, 10 minutes to the airport. Good service and good dinner. We chose to stay this hotel after coming back from Grand Park Hotel at North Male Atoll, very easy for travelers for H78 have a free services to pick up and send back to the Airport. The one thing you need for transit hotel is Pick Up & Drop Off. They are extremely good at this. The staff picks you up at the hotel, if they are not there, just call the hotel using the phone at the airport Information counter outside and the driver comes in 10 minutes. Just give them your next hotel of visit and they will coordinate it for you. The meals there are better than the other 2 I have visited in the same area (not going to name them). Pick the sea view room, they have a balcony. Aircon is strong, water is hot, there's USB charging at the wall and universal sockets. I mean, if you are only going to spend the night there, this is all you can ask for. This hotel was chosen based on other good reviews. The airport pick up and transfer was rather smooth. The room is small and clean; the bed is comfortable. We stayed two nights because we wanted to take a look at Male. There is a beach right outside the hotel. Food wise, it is rather-decent. Breakfast is a buffet - omelette, toast, rothi, Mas huni. Overall, I will still highly recommend this hotel for someone who needs a place to sleep for a night before heading out to the resort or islands. It was just a night stay before going to the main resort. it's a small hotel, but I must say service is one of the better ones. Given the price, our expectation is exceptionally low. But!!! Get the beach view and wake up earlier, it will not disappoint. The sunrise was stunning, the sun was like an orange yolk rising from the sea. Picked us up at airport late at night with a friendly staff member to greet us. The complimentary breakfast was excellent and room clean and comfortable The driver then took us to cruise terminal the next day morning. High CP value, price is good, the staff is very nice. As a stop-over hotel, it is highly recommend. And the breakfast also taste good. The toilet is so small, more racks should be installed. My boyfriend and I stopped over in Male Island before continuing onto our Summer Island final destination. Great location - right on a strip of the beach. There wasn't too much around the hotel in terms of restaurants. We ended up eating at the hotel restaurant most of the time, and we were pleasantly satisfied! The staff however, were the best part. They're super attentive and friendly...and made our stay at h78 that much more enjoyable! Small boutique hotel on the airport island - 6 minute hop from international terminal. As soon as the cab pulled up in front, two staff members were at the door to grab any luggage and direct you inside. There is a restaurant on the first floor - The Catch with AC seating inside, outside by the sidewalk and, during the day, across the street on the beach. My reservation included dinner and breakfast at the restaurant in the morning & one-way transport to the airport. The cab from the airport to the hotel was $10. US. The rooms are sleek, modern-functional and immaculately clean with plenty of closet space and the queen bed was comfortable. The room includes a coffee maker and small refrigerator with bottled water and a flat screen tv on the wall. The AC worked perfectly and there was plenty of hot water; there were toiletry amenities in the bathroom. The staff at both the hotel and restaurant were all extremely friendly, helpful and accommodating. Very well run! They have a small elevator in the hotel! They also have their own vehicle for transfer with H78 name on it. Shower gel/Shampoo was empty during our stay and needed to ask for replacement. Shower cabinet should have 2 glass doors but only 1 remained with a loose handle, making water splash everywhere in the bathroom during shower. Deluxe Suite equipped with an extra bed. Will consider staying again for our next visit. We had to stay at Male for a night since seaplane wasn't operating by the time we've arrived in Maldives. Picked this hotel because it was close to the airport (a 10min drive). There isn't much nearby but the hotel is situated right across the beach which is awesome for sunrise. Room was spacious, had no problem lying 2 28in suitcases on the floor. Had staff escorting us from airport to hotel and back. Our booking includes breakfast but we had to take the first seaplane to our resort so we didn't really get to enjoy it. Overall, it was alright for a night stay. H78 picked us up at the airport without any delay. The staff were very friendly and always smiled. They provided all the information that we needed. The room was not big but clean. Breakfast was ok. I would come and stay again! We check into this hotel for our next-day transfer as we arrived late. The Hotel is well organised and provide pick-up service at the Airport to their hotel where it takes around a 10mis drive. The Hotel was cleaned and staff were friendly. During check in, they will help to coordinate with our resort for next day boat transfer. They even provide complementary bicycle ride to roam around the Island if you have time to spare before your transfer. Choices on breakfast buffet wasnt a lot but acceptable for the price we are paying. Overalls a recommended hotel to sleep over if you do not mind the small size of the room. Across the street from the hotel is a nice beach. You can walk around and it is safe during the night. We walked passing a Mosque, school and supermarket. The dinner at the hotel was excellent comparing that when you moved to luxurious resort you can’t get such deal anymore. The staff are friendly telling us about Maldives. Such a good impression on our first night in Maldives. And it was so close to the Airport. With the complimentary airport transfer, this is a great choice before you head to your resort choice the next day. Free airport transfer to and from the hotel. Rooms are small clean and well maintained. Staff were polite and helpful. Driver picked us from airport, and journey to the hotel was about 15-25 mins, depending on traffic. Hotel just next to the beach, with some trees 'blocking' the view to the sea but still a nice view. Room was large, a/c cold in the maldives sun. Only cons were the toilet flush was occasionally not fully functioning, (just had to fiddle with the flush handle and would be ok after a while. ) and the TV channels was slightly faulty if you tend to channel surf too much. Point to note is that they do not have alot of channels, so don't expect to be able to view that many channels even though its there. Food for bf was great in my opnion with some western and alittle asian dishes. Night as quiet as its not in a crowded area of the town.